VisuXL® contains two key benefits in one masterful solution. Using cross linked sodium hyaluronate hydrates & lubricates the surface of the eyes for longer periods (compared to standard linear sodium hyaluronate) which means you get eye drops for premium dry eye relief and recovery. At the same time coenzyme Q10 (CoQ10) and vitamin E, which are captured into the cross-linked sodium hyaluronate, have anti-oxidant and anti-free-radical properties which help support ocular surface wound healing. All this is provided in a preservative-free multidose bottle and can be used while wearing contact lenses. 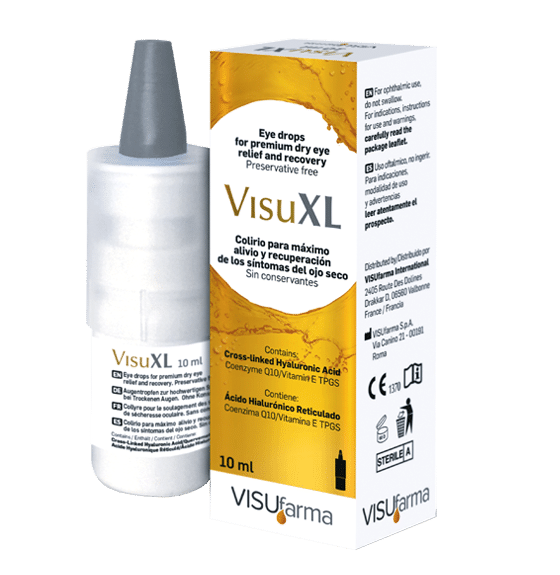 VisuXL® eye drops come in a 10ml bottle. VISUfarma makes every effort to provide helpful, accurate information which is compliant with industry regulations. For more detailed information on VisuXL® please visit our VisuXL website.